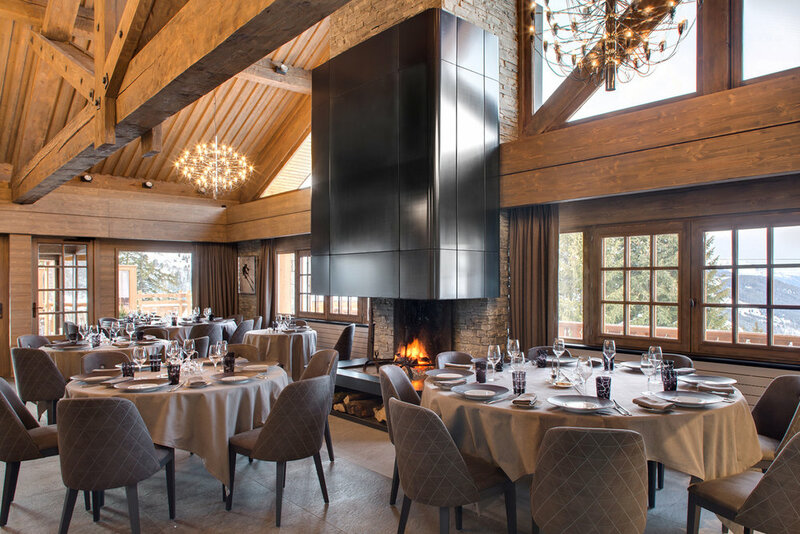 Perched on the mountain overlooking the resort and across the valley to the peaks of the Three Valleys, the hotel is situated in the resort’s smart Belvedere area. A traditional wood-clad/exposed-stone, chalet-style Hotel, it offers the easiest of ski-in/ski-out convenience and fantastic views. The lovely rooms and suites, including family-ideal duplexes, feature wood panelling, flat-screen TVs and wifi, and are decorated in warm, cosy tones. Whether sampling the delicious fine dining lunch options prepared by chef Philippe Vrignaud, or relaxing with a glass of something suitable after a hard day on the mountain, the sunny terrace really is the spot to be. If the weather turns chilly or, even better, decides to bless you with more of that glorious white stuff you’ve come for, then head indoors to the cosy bar/lounge with open fire and comfortable sofas. Or downstairs to the Clarins Spa des Neiges with its plunge pool, sauna and Hammam steam room, various massages and treatments and a small gym. While it should be said that the hotel is some way out of town, the popular Folie Douce après-ski bar is within very easy reach. There is also a regular free bus and the village can also be reached via the Rhodos gondola lift mid-station. In short, this is a very friendly place, offering an excellent standard of accommodation and the perfect spot for “1st lifters”, families not needing too much in the way of après-ski; and dedicated “après-skiers” alike!